That wasn’t always the case. When Coates arrived at Yale as an undergraduate in 2003, a dance curriculum didn’t exist. Drawing from her career with New York City Ballet, Baryshnikov’s White Oak Dance Project, Twyla Tharp, and Yvonne Rainer, she completed an independent project in performance studies. After graduating, she was offered a job to help develop a dance studies program at Yale. Coates now serves as director of that program and artistic director of the World Performance Project, an interdisciplinary research initiative. In 2010, prodded by associate dean of the arts Susan Cahan, Coates submitted a proposal to form a faculty-directed company focused on the intersection of performance and research. Soon after, Yale Dance Theater was born. YDT differs from other dance groups on campus in its rigor—the 18 members rehearse for six hours every week—and in that it is not student-run. “I really wanted a situation in which they would have mentorship,” says Coates. Each session begins with a warm-up class in the choreographer’s style to help students improve their technique. (Yale does not offer a wide range of purely technique classes; many of its courses integrate studio practice with dance history and composition.) And although it is extra-curricular, the initiative is designed to supplement Yale’s dance studies coursework. “It was like the pages of our books coming to life for us, which was really magical,” says junior Amymarie Bartholomew of learning Twyla Tharp’s Eight Jelly Rolls in the pilot program last spring. 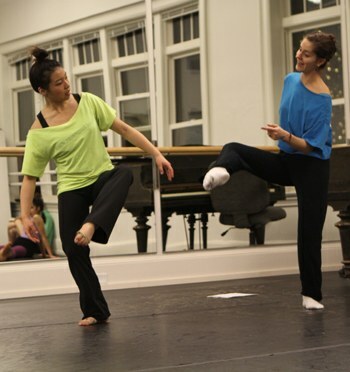 Yale student Cecillia Xie and former Cunningham dancer Jennifer Goggans. Photo by Zoe Gorman, Courtesy Yale Dance Theater.